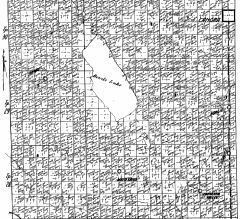 Following are links to PDF files of maps of the Rural Municipality from 1920 to the present. Please note that the maps of 1920, 1926 and 1934 were scanned from archival copies. In order to provide clarity and legibility, these are very large files (18 Mb, 17 Mb and 35 Mb) which may take some time to open and/or download, depending on your Internet connection speed. Your patience is appreciated. RM then (1920) at left, and now. Click the links above to see maps of the RM through almost a century.